This manufacturing plant has been founded to produce electric power devices and electric units for the motor industry. The Company's portfolio of orders is basically oriented to contract production and subcontractor work. Low-voltage electric switching devices, miniature circuit-breakers and residual current circuit-breakers are produced for public electricity networks. Another segment of the orders is constituted by sale for the motor industry; the plastic components are partly manufactured by means of the Company's own plastic die-casting machines. BanKonzult Vill also manufactures and supplies electric units and components used in the railway vehicle industry. Thanks to a new development project the Company is able to manufacture low-voltage switching devices complete, or sometimes to make use of subcontractor support. The Company's technological skill has been improved steadily from the very beginning, and the equipment park has been enlarged. Currently the staff number is round 90.
and an organisation has been established to operate this system. Customers control the quality of the Company's deliveries for the motor industry with VDA6 (Verband der Automobil Industrie) regularity. The production is practically exclusively export-oriented. Hungary's EU accession has definitely had a positive impact on the Company's business opportunities and flexibility. Orders are performed by door-to-door delivery, partly by the Company's trucks. 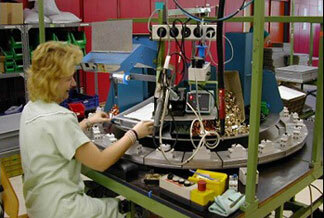 The production plant and the logistic system are located in a three-story building of 3000 m2 in Ózd. The current stage of development has been achieved with steady resolute hard work; proof of it is a portfolio of orders increasing year by year. Cím : 3600 Ózd, Alkotmány u. 4.